If you are like me, its been my mission this year to get stronger and healthy in 2016! I wanted to start off small and begin with finding more ways I can drink water everyday. I was also inspired by this article last summer How to Drink More Water. There are so many different articles and information about the benefits of drinking water. Here are a few that stuck with me. 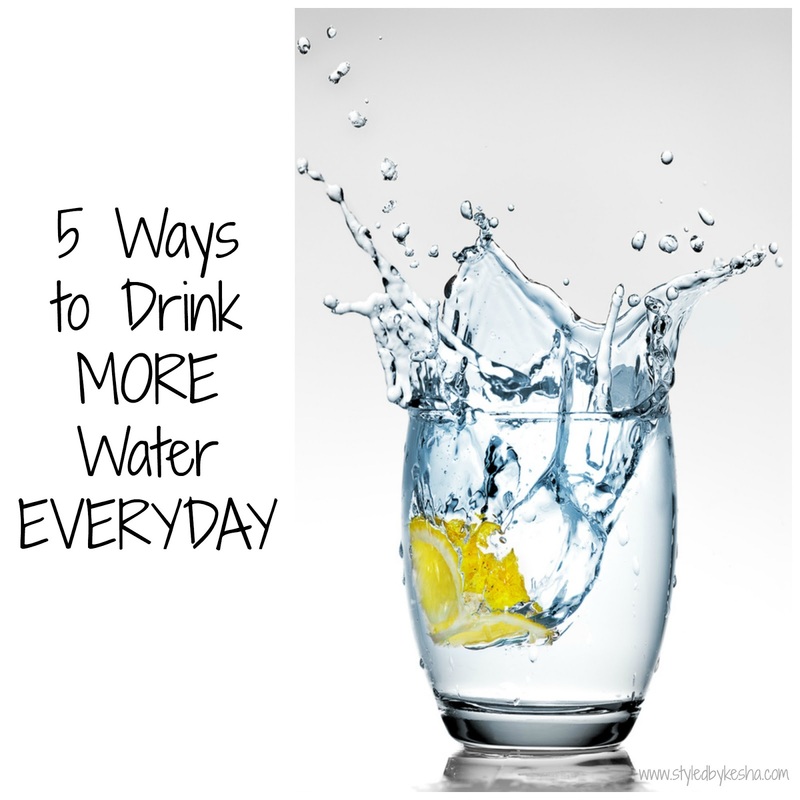 Since I am dedicated to including water in my daily tasks here are 5 ways I drink more water every chance I get. A very wise blogger (aka Mattieologie) once taught me that preparation is the guaranteed way to get to your daily goals accomplished such as drinking more water. In order to drink water first thing in the morning is place a glass of water on my bedside table before I go to sleep. That way when I wake up its the first thing I see when I open my eyes and there is no decision to be made, its just for me to do it and move on to the next task of my morning routine. Drinking water first thing in the morning not only wakes you up but gives you that jumpstart to being productive and actually getting things done. One of my goals with drinking more water is drinking 64oz or 8 glasses of water daily and the way I can do that is to take water with me everywhere. I have a reusable plastic water bottle that is filled in the morning and everyday I finish that water and refill it I feel like I am getting closer to my goal of being healthier and stronger in 2016. Since I have decided that I am drinking more water daily, it has become a lot easier to make a decision when eating a meal. I am so used drinking my favorite fruit juice with my food and now that I drink water and feel healthier and cleaner in my body. It has become easier to choose water over juice or any other sugar filled drink. Even when I eat at restaurants I stick with water with my meals. It saves me that extra $3 add to my bill. After research and talking with my friends I have found that drinking warm water has a lot of health benefits with your digestive system and skin health. Its something that I need to get used to because I am not a fan of sour tastes but I know I need to train my body to think and act differently in order to see the long term benefits. I already feel better especially since I drink warm lemon water after breakfast or before I go to sleep. I have not tried this way get but I can say that drinking more water gets you to choose healthier options for Breakfast, Lunch and Dinner. I do make green smoothies and eat fruit and vegetables now that water is becoming more of a habit. What ways are you going to try drinking more water?